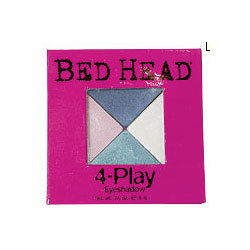 Open up your eyes with Tigi Bedhead 4 Play Eye Shadow. This product is a colour surge eye shadow, quad containing different shades, which can be worn individually, as pairs or all together. Opening up endless opportunities for wardrobe possibilities. There are four coordinating shades within one, making life just that little bit easier. These fantastic eye shadows transform the eyes containing a formula that is crease resistant, blends easily and last all day. Decide on how many shades you would like to use. This explains how to apply three different shades of eye shadow. To start apply a small amount of foundation to both eyelids using your ring finger. This provides a base that revels the true colour of the eye shadow. It also gives the eye shadow something to cling onto stopping it from slipping. Gently dab the brush over the lightest eye shadow. Tap off any excess powder. Sweep the brush lightly over the lid from lash to brow. To add the medium shade, load the brush as before tapping to remove any excess powder. Apply the eye shadow over both eyelids and into the socket line, blending with the brush. Finally add the darker shade to the outer corners above the upper lash line and into the socket line. Then carefully dust a little along the lower lash lines at the outer corners to create a v shape.